Qualfon's business is growing in Guyana, South America and expansion is expected to continue through Q1 2017. Executives hold a positive outlook for 2017, particularly as Qualfon gets closer to opening a second contact center facility at the Providence Campus. 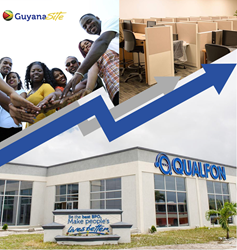 Clients are pleased with the top-level performance and leadership at Qualfon Guyana, so they are making additional investments in our partnership, expanding Qualfon’s customer service programs with more employees. Qualfon, a mission-driven business process outsourcing (BPO) company and global provider of contact center services, is growing its business in Guyana, South America. At the Providence Campus contact center, Qualfon’s existing client accounts expanded by approximately 250 full-time positions during Q4 2016, and growth is expected to continue through Q1 2017 with an estimated 120 additional full-time positions. The growth comes largely from customer care programs serving clients from both the technology and eCommerce industries. “Clients are pleased with the top-level performance and leadership at Qualfon Guyana, so they are making additional investments in our partnership, expanding Qualfon’s customer service programs with more employees. This means positive growth for our business and more job opportunities for the local community,” explained Mark VanderPloeg, Site Director, Qualfon Providence Guyana. Qualfon attributes the success to its tight focus on proactive leadership investment and contact center results. “Qualfon’s Leadership Academy is developing entry-level employees into leaders long before they take on supervisor roles and responsibilities. This improves front-line decision making and empowers our client programs to have scalable and sustainable leadership. Clients are rewarding this readiness because our customer satisfaction results are meeting and exceeding expectations,” added VanderPloeg. With the forward momentum, executives hold a positive outlook for 2017, particularly as Qualfon gets closer to opening a second contact center facility at the Providence Campus. The 10-acre, multi-building complex is already home to one 57,000-square-foot contact center, and the second center will soon double its footprint and operational capacity adding 1,020 new workstations. It is expected to open in Q2 2017. “It’s an exciting period of client growth and expansion at Qualfon Guyana. An outstanding year lies ahead of us, and we’re working hard to make 2017 the best year yet. Now is the time to join us as a client partner or as the newest member of the Qualfon family,” said VanderPloeg.